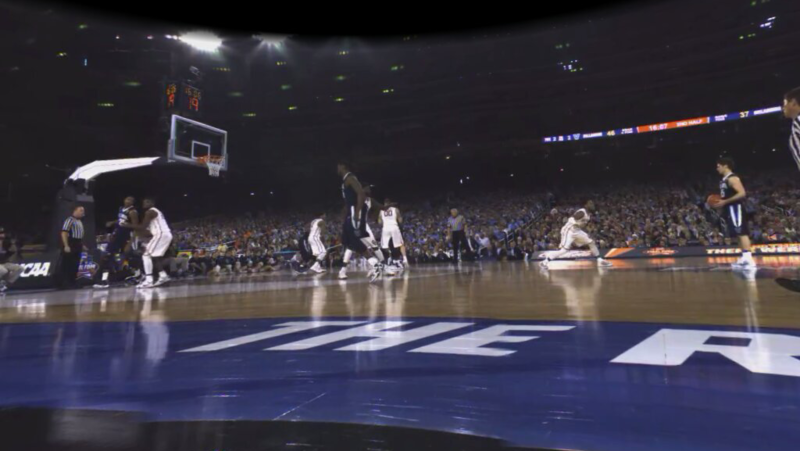 So far, all of the live sports I have seen in Virtual Reality have been through NextVR’s app. However, a newcomer is streaming the NCAA Final Four games. 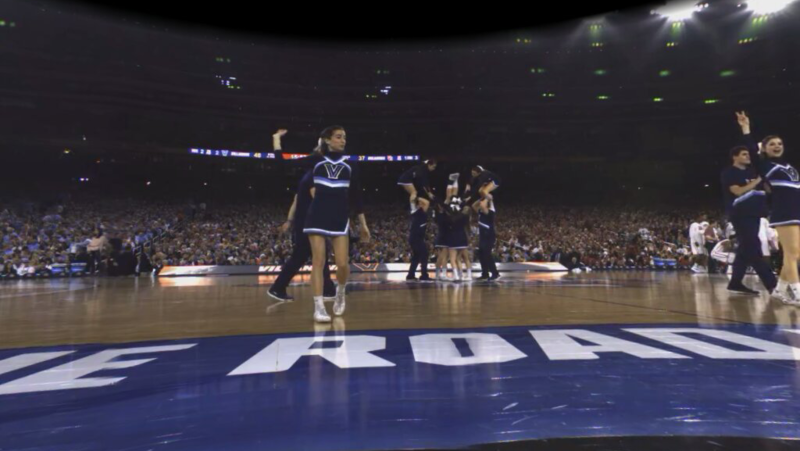 Voke is a Virtual Reality company who streams live events, and they have partnered with Capital One and the NCAA March Madness tournament to provide the Final Four games. I watched the first game between the Villanova Wildcats and the Oklahoma Sooners. Long-running live events can be difficult for Gear VR because the phone will heat up and need a break after a while, which interrupts your experience. There were definitely some adjustments that could have made the experience better, but all-in-all, it was entertaining and a step in the right direction for live sports VR. 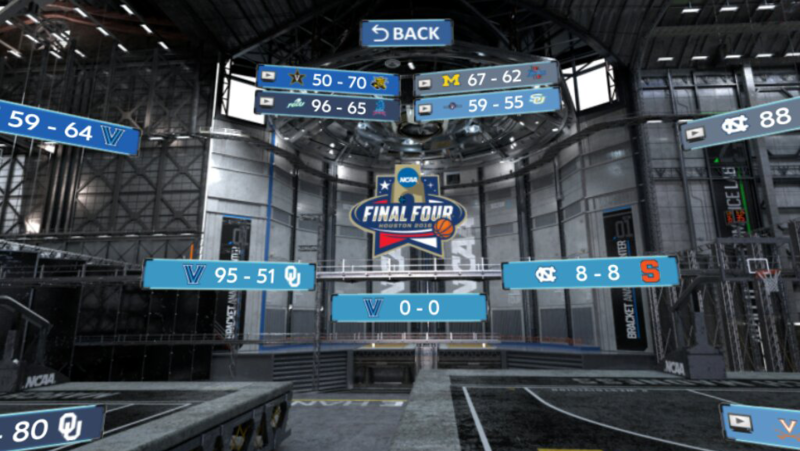 When the app loads up you have the options of clicking on the Bracket, Watch Live, or Replays. Replays is supposed to show you replays of the three VR games they broadcasted live. I had just watched the first game so there were no replays available yet. If you click on the Bracket, it displays the March Madness bracket with scores of each game. You can then click on each game to watch that game’s highlights in 2D on something that looks like a large movie screen. The real reason people download the app, though, is for the live games in VR. After clicking on Watch Live, you get a 180-degree view of the game from courtside at half-court. You do have a 3-dimensional VR view. The 3-D aspect is much more pronounced with objects close to the camera but the 3-D does not seem to “pop” as much as broadcasts I have seen before with NextVR. I did however enjoy that I was not transported against my will to other camera angles, and I was able to enjoy the game with my own personally-directed gaze and continuously. Additionally, there was a scoreboard in the upper-right hand part of the screen with minimal stats including the score, quarter, fouls, and amount of time-outs left. I definitely recommend the experience but there are also several aspects where it can improve. To start, the camera positioning needs to be better. It felt a little further back than it should have been but, to be fair, that is something they may not have much control over. However, the height definitely needs to be changed. You felt like you were watching the game from the floor. Twitter member @SweetJohn said he felt like he was watching the game from under a table. Additionally, there was another floor-level camera on a slider track that passed back and forth in front of you throughout the game. The camera should have been higher just from a general perspective level, but also so it would have been higher than the moving camera in front of it. One other note on the camera, is that it would sometimes bounce a little when the arena got loud. It did not happen too often, but some stabilization to prevent this will help from causing nausea. Another criticism is the amount of dead space in the app. As mentioned, the view is 180-degrees. But also, you are placed back a little from the view, which increases the amount of dead space you see. It leaves plenty of room to put up other stats or highlights you can glance over to. Another option is to expand the view so you can look over at other fans to feel more immersed, like you are actually in the arena. The scoreboard could also use a renovation, as it was pretty simple and missed some key game stats like the amount of time left in the half. You also had to turn pretty far to one side to see it, so the placement could have been better as well. Despite the criticisms, I definitely give Kudos to the NCAA, March Madness Tournament, Capital One, and Voke for putting this together. We are still very early in the adoption phase of VR, and companies willing to invest and take risks on products like this is what will make it better. It will be hard to compete with the well-established products already created for the big business that is live sports. But if companies keep investing in VR events then Virtual Reality has the opportunity to become a major media form with how we all watch our sports in the future.